When I was first told about this difference I concluded that it was yet another case of poor registration on a Walsall printed booklet. On most of the booklet we have the window frames in the tower are doubled due to mis-registration, and the thickness of the caption bar, BOSTON MANOR ART DECO STATION, on the booklet stamp is thinner than on the sheet stamp. 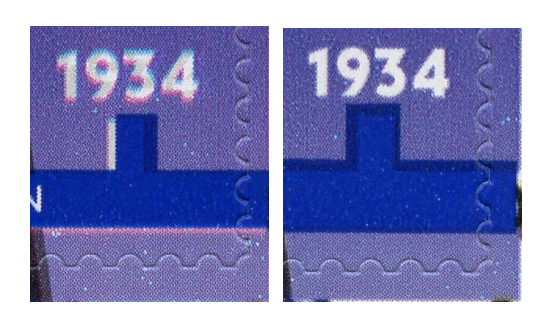 However, Dominic has now sent scans of two booklet stamps which show not only that the vertical height of that blue bar is variable (as might be expected from mis-registration), but that the spur up towards the date 1934 is also different. Although there is some mis-registration on the left-hand stamp (see the shadow on the Queen's head and the ghostly grey colour of the face value), the thinness of the bar below 1934 is much thinner on the left-hand stamp than on the right. And if you look at the blue caption below the stamp, this also seems to be shorter on the right-hand stamp, although that may be a trick of the scanner: I've asked for that to be checked. UPDATE 25 January: My thanks to John G for this larger picture of the lower right corner. This clearly shows that, while the amount of dark blue appearing in the spur is partly governed by the white space in the bluc background, the actual dimensions of the dark blue print are much greater in the right-hand stamp than in the left. There are definitely at least two versions. But why? There should be one image dropped into every position on the cylinder. Is it time for Walsall to give up printing these multi-coloured booklets? One customer rejected multiple copies of the Queen's Diamond Jubilee booklet from other sources and asked if we had just one with the face value in white instead of with a cyan or magenta edge. In fact we have several, but it did seem that the 'good' ones were not as common as the blurred ones. Which version is the most common? The quality control on these self adhesive booklets from Walsall has been incredibly bad over the last few years, with constant examples of mis-registration. With the modern technology available this does surprise me and I can't really understand why RM haven't taken them to task on it, but it probably comes down to cost. I'd love to see printing switch to DLR, not only because of the poor quality but also because of the very unfair and inconsistent way that cylinder booklets are distributed. With DLR historically you got a Cylinder booklet every fifth booklet in a sealed pack without fail. Walsall's are all over the place and Tallents House won't pick them out despite the demand for them. The end result is worse than a lottery and it needs changing, frankly. Update: a better picture has now been added. 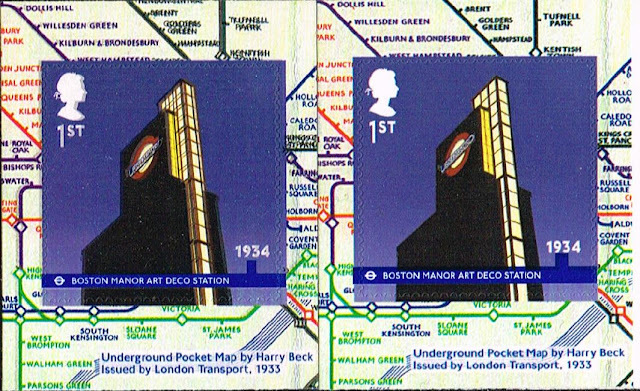 As for scarcity, any booklet with all the colours properly registered is probably less common than one which is blurred (though not as scarce as a good copy of the similarly poor Diamond Jubilee booklet issued in May). But I have no idea about the numbers of wide and narrow dark blue - we have only just conclusively proved that there are two! Cynical here, why both Walsall and Royal Mail can't be bothered comes down to money, who's making more cash from poor registration, who sells more. My booklets are mis-registered giving a slightly different effect. On your left hand illustration it shows a white bar on the left underneath the '9'. On my booklets the white bar appears on the right hand side underneath the '3'. This also results in a very pronounced ghost image of the queen with a grey shadow on the front of her face! Updated Information on these booklets is on blogpost Friday 22 February.